Building Endeavour: (Clockwise from top left) This photo sequence illustrates the how the Orange County Space Society pieced together the shuttle mock-up at the Discovery Science Center. Contrary to what NASA says, there actually are Space Shuttle orbiters under construction in Southern California. Not far from the old Rockwell Space Division, where the Apollo Command Module was built and the first pieces of the shuttle came to life, is the reincarnation of another shuttle, the Endeavour. First conceived as a replacement for the Challenger, lost in 1986, Endeavour was rolled out 14 years ago, in April 1991. However, a second Endeavour was also constructed. This one was unveiled five years after the first, on July 14, 1996 in Mountain View, California, as part of a two-orbiter set at Space Camp California. Financial difficulties forced the closure of that facility and the orbiters Endeavour and Atlantis sat lonely vigil inside the abandoned structure, awaiting a day when and where they could again be used to simulate flights into space. In 2003, the time appeared to have arrived when the idea was presented to form a new Space Camp in Long Beach, inside the Spruce Goose dome at the Queen Mary site. The idea was to set forth and dismantle the orbiters, their associated mission controls, and all other simulators, once complete, lock, stock, and shuttle tiles, would all be trucked 400 miles south to take up their new residence. The equipment was purchased--literally in the nick of time--by a member of the Orange County Space Society and founder of Space Camp Turkey, Kaya Tuncer. He was also ready to step in to finance the entire project, thus guaranteeing the viability of this new Space Camp. Project management declined his offer. The dismantling operation proceeded as planned. However, a glitch surfaced in the financial world of the new Space Camp, forcing abandonment of the project in mid-stream. In this case, that meant we had all the equipment, it was disassembled and moved south, but we no longer had a place to set it up. The orbiters once again became orphans as they were relegated to the corner of a warehouse in Chino for two full years, gathering dust instead of inspiring hearts and minds. Kaya never gave up hope of eventually finding a new home for the vehicles and the other simulators. I worked very hard to help either find a buyer or else a proper place to donate the equipment. Diligence finally paid off after lots of legwork and phone calls. 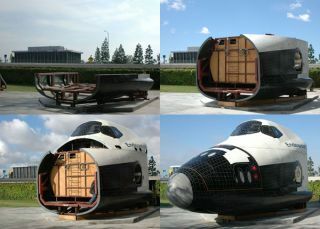 A new home for Endeavour and half of the other simulators was found at the Discovery Science Center in Santa Ana, CA. The second half, including Atlantis, would go to the San Diego Aerospace Museum. Initially, San Diego was scheduled to build their orbiter first, while the Discovery Science Center would put theirs into storage for another couple years, awaiting the building of a huge addition to the science center a large part of which would be dedicated to space exploration. Once again, plans quickly changed as it was decided in Santa Ana to re-build Endeavour this year and place it outside under DSC's signature Cube. The other simulators (The Manned Maneuvering Unit MMU, 5 Degrees of Freedom Trainer 5DF, Space Mobility Trainer SMT, and Mission Control) would be placed inside as part of a summer-long space program called "Space: Next Stop Mars." around the world in Izmir, Turkey. Getting them here would be one hurdle, but making sure we could do it in the time frame imposed by their duties in Izmir would mean we had just a one-week window to accomplish the entire task. Discovery Science Center agreed to bring over the experts from Turkey, so everything was set in motion. A team of laborers was assembled, large equipment such as a forklift and crane were located and reserved, a concrete pad was poured to give a level surface to build the shuttle, and flight arrangements were made for our overseas experts. After a good night's sleep, but still suffering from jet-lag from a 24 hour flight west, Faruk and Tamer joined our team and we all set to work. The portion of the shuttle orbiter to be constructed was the forward section from the nose cap to the cargo bay wall. Even this is huge, measuring a total of 19-feet wide, 19-feet high, and 32-feet long. It consists of three levels: three pieces of the base, two pieces of the mid-deck, and two pieces of the flight deck, along with large fiberglass side walls and the jigsaw of the nose section. I had the privilege of laying the cornerstone of Endeavour myself, by lifting the rear base piece with the forklift and placing it delicately on the concrete pad. Everything else would now be based on the location of that initial piece. Work proceeded very quickly, because we knew we had limited time. We also had a weather forecast that said we would lose an entire day due to an expected downpour. I was very worried about the effect of the rain on the exposed structure. In the end, things worked out wonderfully in that the rain did arrive but only washed away two years of grime accumulated in storage. And instead of a whole day, the rain passed quickly, so we only lost about two hours before getting back to work. other simulators took the last day in our schedule. As Endeavour materialized under DSC's solar-panel-covered Cube, we attracted much attention from passers by. Main Street in Santa Ana is just a few yards from the shuttle and people walked and drove by, gawking at the scene unfolding over the course of the week. Guests of the science center sometimes found the outside door that led to the Cube and watched our efforts from the railing. Endeavour is also clearly visible from the Interstate-5 freeway. In the end, we accomplished our goal. A new Space Shuttle was built and ready for flight, if only in our imaginations. Endeavour now takes its place as a new icon of the Discovery Science Center, its stark white and black paint job in contrast to the dark brooding Cube directly overhead. Soon, the orbiter will be opened to the public and they will be able to take a first-hand look at what the astronauts would experience living and working on orbit. Joining Endeavour will be several other simulators, ones you can actually get on and ride. The MMU, SMT, and 5DF will give you a taste of spaceflight. Other exhibits will take you to the surface of Mars and beyond. All this opens on June 17 and will run for three months. Endeavour itself will probably stay where it is, standing vigil outside DSC, until the new expansion building is constructed in the next couple years. At that time, we will again take the orbiter apart and re-locate it inside. Its full functions as a spaceflight simulator will also be restored, connecting it again to Mission Control where teams will fly missions into the future. All this is just the beginning. The second orbiter, Atlantis, waits for its day to shine in San Diego. As we get close to the return to flight of the Space Shuttle fleet at Kennedy Space Center in Florida (hopefully by mid-July), Southern California will soon lead the way with our own two-orbiter fleet.